**Note: We're doing our best to catch up on some of the films that slipped through the cracks here at the Cleveland Movie Blog before the year is over. I missed PLANES when it screened for critics this past summer, but as the father of a toddler who loves the CARS films and anything associated with them, I knew I couldn't escape this CARS spin-off forever. When it hit home video a few weeks back, I found the Blu Ray on sale cheap at a local shopping emporium, and given that the boy watches the CARS movies over and over again, I figured buying it was the best way to go. The things we do for our kids. Anyway, next family movie night PLANES was the feature presentation. 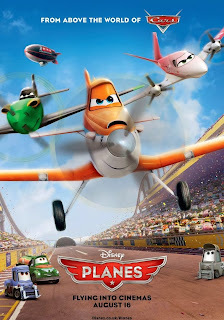 Following the CARS formula, the plot of PLANES revolves around a big race and an underdog contestant. In this case it's an around the world air race, and the unlikely flier is crop duster Dusty Crophopper (voiced by Dane Cook). As such films require, Dusty has a group of quirky friends and allies including forklift Dottie (voice of Teri Hatcher), fuel truck Chuck (voice of Brad Garrett), and for a mentor, a grounded old war plane named Skipper (Stacy Keach). On the opposite side is the cocky front-runner in the race, Ripslinger (voice of Roger Craig Smith). Dusty does better in the race than expected, and starts to become popular with the fans after helping British contestant Bulldog (voice of John Cleese) out of a tight spot even though it costs him precious time in the race. Fearing he might lose, Ripslinger resorts to dirty tricks in an attempt to take out his rival, but come on, we all know how this is going to end. Well, maybe not my son, but cut him some slack; he's not quite three yet. But even he seemed kind of bored with this feature length toy commercial. The characters are bland as can be, the jokes barely qualify as such, and the story just glides along to its obvious conclusion without even a single divergence from its straight and narrow flight plan. You'll actually find yourself wishing that Larry the Cable Guy would do a cameo as Mater to lift the film's level of humor and sophistication. There were worse movies this year to be sure, but few that had the sort of talent and resources available to them this film had. Even as the cynical cash grab it so obviously is, PLANES manages to fall below expectations. 1 out of 4 stars.